Model BVF Butterfly Valves are Lug Type. The heavy duty, one piece body is designed to be installed between all types of ANSI 125 / 150 flanges. Resilient seat provides bubble tight shut off. Blowout proof stem with pinned disc. Universal mounting flange conforms to ISO-5211. The 2.5” through 6.0” sizes are supplied with an adjustable flow positioning plate. 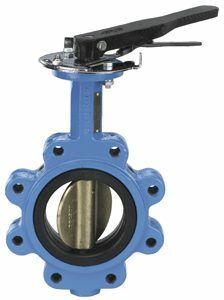 This unique design provides quick and easy setting of the valve flow position, requires less hardware, will not slip and allows the valve to be easily moved to the closed or full open position without disturbing the flow positioning set point. The 8.0” through 12.0” size Butterfly Valves feature a gear operator.